I woke up to the alarm in my motel in Bishop a little before 5:30a. A quick breakfast in my room, throw the stuff in my car, and off I went up SR168. The sun was already up, and Mt. Tom's massive profile was bathed in sunshine and inviting me to climb. Another day perhaps - I didn't want to wear myself out before I had a crack at Williamson the following day. 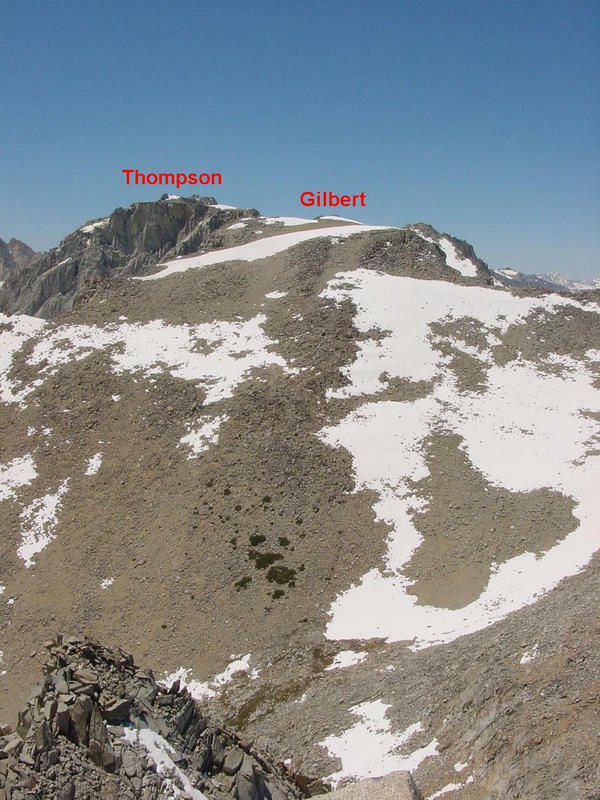 Instead, I made plans to climb out of South Lake, to explore a part of the Sierra Crest I had yet to visit, between Mts. Darwin and Agassiz. There are more than half a dozen major peaks along the crest there: Mts. Gould and Hurd (not actually on the crest) seemed the easiest, while Mts. Thompson and Powell seemed a bit much for a warmup hike (still others like Clyde Spires, Mt. Wallace and Mt. Haeckel were similarly long approaches). So I set my sights on Mts. Gilbert and Johnson, located between the other sets, as a good full-day workout. I took the first left and headed towards South Lake, going down then up opposite sides of lateral moraines. While it appears to be a tedious climb without the road, I imagined how impressive it must have looked 10,000 years ago when the glacier came down to this low elevation during the last ice age. How different all the Sierra must have looked! Arriving in the parking lot at the end of the road, there were plenty of cars in the backpackers section, but no one in the day-use lot where I parked. The sky was absolutely cloudless and it looked to be a fine day - perhaps too warm. I hoped I hadn't started too late and would be able to reach the higher elevations before it warmed too much. Because I had crampons and axe with me I carried my climbing pack, but it weighed little more than 10 lbs. With my comfortably light pack shouldered, I headed out at 6:30a. The first mile follows the Bishop Pass Trail which I had taken last summer for a climb of Mt. Agassiz, but then I turned off at the trail junction and headed on new trail (for me) towards Treasure Lakes. The trail traverses across a few small streamlets that feed the south side of South Lake, including a few hundred feet of elevation loss that I would not be looking forward to at the end of the day. The trail then begins to climb up more steeply as it approaches the first of Treasure Lakes. The first two are fine camping destinations nestled among the pines near the edge of treeline, and if not for the mosquitoes would be quite inviting (I didn't stop long enough to give them a chance to become better acquainted). The trails winds between the two lakes before petering out three miles from the trailhead. It was 8a and I'd just passed 10,800ft, and if there was a use trail that went higher I wasn't able to find it. The West Face of Hurd Peak was now to my left. While not as high as the surrounding peaks, it is very prominent when viewed from the trailhead at South Lake. I have been eyeing this peak since my trip to Agassiz, and I was interested in finding a carry-over route that I might take some time in the future. I followed a small ridge with fine climbing on the right (west) side of the creek, and was really enjoying both the views and the hiking now. The peaks displayed before me were a bit confusing. Earlier near the trailhead, what I had thought was Mt. Gilbert was really Mt. Goode, and there were smaller fore-peaks that I thought were on the Sierra Crest that blocked the views of Mts. Johnson and Gilbert. The unnamed peak at 12,040ft+ that was now to my right turned out to be the northeast end of a ridge that ran up to the crest between my two goals. As I climbed higher I followed the righthand branch of the stream, bypassing three of the upper Treasure Lakes. I soon had a better view of the canyons near the crest and was able to finally make sense between what I was looking at and what my map had been showing me all along. Mt. Johnson could now be seen ahead of me, and I could see where the canyon headed right (west) towards Treasure Col. I had been ready to discredit the mapmakers who had seemed to be lying to me, but now I felt better and all was right with the world again. The nicer climbing ended and the boulder hopping picked up as I made my way to the highest of the Treasure Lakes at 11,300ft. I skirted the lake on the west side, then put on my crampons and headed up the snowfield above the lake. After enough boulder hopping, snow travel seems the much preferrable option. The snow continued up into the bowl north of Mt. Johnson, and here I had several options for gaining the crest. To the left was the snow-filled chute leading to Treasure Col, described by Secor as the usual route to Mt. Gilbert. To the right was a class 3 variation that goes up mostly rock to a point just south of Peak 12,640ft+ which lies betwee Mts. Johnson and Gilbert. Further to the right was a snow chute that lead to the east ridge of Mt. 12,640ft+, and seemed to offer the most direct route to Mt. Gilbert. This last route was not described in Secor, and one would have to climb up and over the summit of Mt. 12,640ft+ to get to Gilbert, and I had no descriptions of how that route might go. So I chickened, and headed for the safe route up to Treasure Col. In hindsight I wish I had tried the other snow chute to the far right. The climb up to Treasure Col was straightforward and pleasant. Not too steep, easy stepping up the soft snow that had been exposed in the sun for a number of hours by now. It was about 10:30a when I arrived at the top and finally had a view of Mt. Gilbert, still about a mile away. I had hoped to be on the summit by now, but was still some time and distance a way. The downside to this route is the necessity to lose elevation before gaining the easy Southeast Slope of Mt. Gilbert. The downclimbing on the west side of the pass was tedious as I traversed diagonally, wishing to make as straight a line as possible to Mt. Gilbert. Clambering over, around, and down large blocks gave me time to wish I had explored the other route option mentioned above. Oh well, no taking it back now. I probably would have tried that variation for the descent except that I had my sights set further on Mt. Johnson, so I would need to get back to Treasure Col and the most straightforward way to do that would be to retrace my steps. At the low point (this canyon on the west side leads down to Big Pete Meadow on the JMT) there was a small stream that I used to re-supply my water, and then I headed up the class 2 Southeast Slope. This is an easy climb except for two things - there's a good deal of sand which makes upward progress a bit more difficult, and secondly the elevation was getting to me. Less than 24hrs ago I had been at sea level, and now above 12,000ft I was getting a slight headache and feeling lethargic. I rested more often now, and eventually topped out at the summit at 11:30a. I ate a small snack, rested a bit, and took pictures of the views around me on all sides ( N, NE, ENE, E, SE, S, SW, WSW, W, NW). There was a small summit block (not really the summit) to play around on, and I marvelled at the steep snow couloir I could peer down on the west side (this is the 5.6; AI2 or WI3, North Couloir described by Secor). Almost all of the route appeared to still have snow on top of the ice, which meant I might have been able to negotiate the 50-65 degree slope with just my crampons and axe, but I wasn't going to test that weak theory out today. In the summit register, placed in 1972, I found R.J. Secor's name amongst that Sierra Club party that placed the register, likely one of the first peaks he climbed in his 30+ years of climbing. Later I found his Feb 1996 entry, purported to be the first winter ascent of the mountain. I imagined what the views must look like in February, with snow as far as the eye could see, and R.J. sitting on the summit leafing through all the entries to see if anyone had previously visited during the winter months. It's a hard thing to prove definitively since many summit registers are buried under snow during this time, making retrieving them impossible without knowing the exact location. One has to rely on people reporting winter Sierra climbs in publications (or more recently on the Internet) to gauge such information. Clearly I wasn't in any danger of setting any "firsts", so my perusal of the register was my usual flipping through and spot checking for interesting finds. I left the summit of Mt. Gilbert at noon, and retraced my steps to Treasure Col, arriving at 1p. I was happy to find I still had enough energy and desire to hit up Mt. Johnson. Surveying the route, I chose to downclimb about 50 feet so I could enter a steep chute just west of the north ridge. The climbing almost immediately became class 3, and to my surprise, highly enjoyable. Secor has only a short 5 words to say about the North Ridge: "Class 3 from Treasure Col," but I soon found this to be one of the better class 3 climbs I'd yet encountered. After some loose rock at the bottom, the rock became solid with fine climbing, and seemed to have a bit of everything including some adrenaline-producing exposure and a short knife-edge section along the way. The left side of the ridge is dominated by huge, steep slabs of granite (with only a few lingering places covered in snow this time of year), while the west side is a jumble of broken rock in a mix of steep chutes and spires. But the ridge itself offers a superb climb, one I'd highly recommend if you're heading to Mt. Johnson. So enthralled was I with the climbing, I forgot to take any pictures of the route along the way! I reached the summit of Mt. Johnson at 2p, and found views similar to those on Mt. Gilbert, though finer views of the Palisades off to the southeast. I could make out all 14ers in the area with the exception of Polemonium which was blocked behind the higher summit of North Pal. To the south was a fine view looking into LeConte Canyon, through which the JMT meanders as it makes its way between Muir and Mather Passes. I didn't stay long, just enough time for photos, a quick snack, and signing in the register. I carried all my stuff (mostly the crampons and axe) to the top because I wanted to do a carry-over down the class 2 Southeast Slope. This turned out to be a fine idea, and I had no trouble making my way down through the rocks (with some loose sandy sections). This brought me down into another canyon between Mts. Johnson and Goode, and I enjoyed the alternative route down with the new views. Much of Mt. Goode is blocked by an intervening ridge, but what can be seen of it looks quite impressive. The cirque curved left and headed north, rejoining my inbound route in about a mile near the upper Treasure Lake I had passed earlier. This time I traversed around the east side of the lake, and soon rejoined my earlier route. By 3:30p I had picked up the trail again at the lower lakes, and was another hour and fifteen minutes returning to the trailhead. I had hoped to be out anywhere from six to seven hours, but in fact it was just over ten hours and I was fairly beat. While the acclimatization effort was surely successful, I was afraid I may have overdone the hike as a "warmup" for the more strenuous attempt on Mt. Williamson the following day. Time would tell. I drove back to Bishop where I got a motel room before dinner at Jacks. I was surprised to see Mark (who I've climbed with numerous times before) and Doug (who Mark has climbed with numerous times before, but as yet unrecognized by me). They had just come back from climbing the St. Jean Couloir on Split and were finishing dinner when I arrived. Not surprisingly, I was unsuccessful in talking them into trying Williamson the next day - that they decided was for crazy people. Oh well.